Due to its high measuring speed, the Inspector® FQ handles applications for conventional coordinate measuring machines that would never have been considered before because of excessively long measurement times. This flexible machine replaces manual gages or gaging fixtures, for example when inspecting large sheet-metal and plastic components. With a synthesis of precision mechanics, optoelectronic sensor systems, image processing and measurement software, the Inspector® FQ enables measurements on the shop floor with short cycle times. The modern drive concept, based on linear motors, provides very high measuring speeds. With acceleration equivalent to earth’s gravity (1 g), the machine can reach up to ten measurement positions per second. Positioning speeds of 1000 mm/s minimize cycle time when traversing long distances within the measurement volume. At many companies, workpieces such as large sheet metal parts, plastic tubs, or guide bars are inspected using gages. Each workpiece must be inspected individually, and a custom gage is required for each product. These gages have to be modified or replaced every time a product is changed. Each gage must be checked regularly and recalibrated as needed. This effort is significantly reduced when using a flexible coordinate measuring machine. Workpieces are inspected fully automatically, and only a single measuring machine needs to be monitored. Different measurement sequences can be created on the Inspector® FQ for various products. 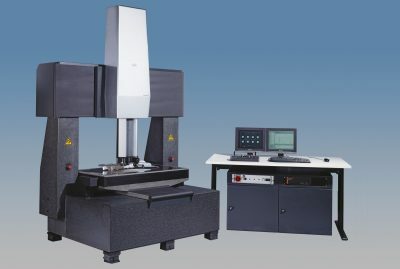 As another advantage over gages, the coordinate measuring machine produces objective measured values instead of a subjective declaration of good or bad. The digital measured values can be used for statistical process control (SPC) when networked with CAQ software.